Wagering at Santa Anita Park in January was down, lagging 10.81% behind the same month in 2010 and worse than the nationwide decline of 9.71%. Reasons for the decline are varied, but one factor is an ongoing boycott of California by members of the Horseplayers Association of North America, known simply as HANA. The boycott is a protest of the state’s increase in takeout from 20.68% to 22.68% for exacta wagers and from 20.68% to 23.68% for wagers involving three or more horses (trifectas, superfectas, Pick 3s, etc.). As a quick explainer, takeout is what drives the Thoroughbred racing industry. A percent of each dollar wagered is taken out to pay for state taxes, racetrack operating expenses, purses, and state incentive programs. All the “costs” associated with a wager are important, but every fraction of a percentage withheld is that much less going into the pockets of gamblers—and the serious players know which tracks are offering the greatest returns. California’s ability to grow purses is limited. Compacts with Native American casinos have effectively shut out the option for slot machines or video lottery terminals at the tracks. And the state doesn’t have any money to offer a subsidy to racing as an agricultural venture. The state has approved exchange wagering, but that won’t be available until at least 2012. So how did the state decide to increase purses? It raised takeout. The racetracks and the Thoroughbred Owners of California have pointed out the takeout on win, place, and show wagering is still among the lowest compared to other racing states. Santa Anita’s is 15.43%, certainly lower than Tampa Bay Downs (17.5%), Gulfstream Park and Fair Grounds (17% each), and Aqueduct (16%). The takeout on trifectas and superfectas is also lower compared with Tampa Bay Downs (25.9%), Gulfstream Park and Aqueduct (26% each), and Fair Grounds (25%). Santa Anita, however, is the highest among these tracks on exacta, daily double, Pick 3, Pick 4, and Pick 6 wagers, with the exception of Fair Grounds, which has a 25% takeout on Pick 3s, Pick 4s, and Pick 6s. The downside of raising takeout is it discourages the large bettors from participating. Why wager on a Pick 3 at Santa Anita with a 23.68% takeout when Tampa Bay Downs’ Pick 3 takeout is 18%? 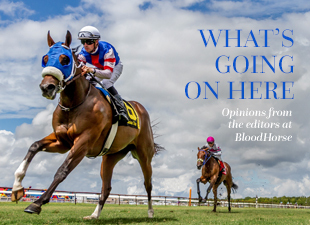 While the tracks and owners argue the higher takeout will still generate more money despite the lower handle, the horseplayers are arguing the tracks would have gotten more had they lowered the takeout and promoted more wagering. But takeout is only part of California’s problems. The Golden State also suffers from declining field size. Gamblers don’t like betting on small fields either because the odds are typically low for each horse. Larger fields provide more opportunity to find a horse at a price. Through the end of January, Santa Anita’s field size is tracking on average 4.2% smaller than it was through the end of January 2010. The average field size is 7.71 horses per race compared with 8.05 a year ago. As a comparison, Tampa Bay Downs is averaging 9.11 per race and Gulfstream Park is 9.68 per race. Graded races should offer big wagering opportunities because they are the highest-profile events, but California’s graded stakes in January averaged 6.17 horses per race compared 7.73 in January 2010. The Jan. 9 Santa Ysabel Stakes (gr. III) had three starters. Other factors hurting California include the languishing economy and, even though it started with rave reviews, the new dirt surface. A change in surface makes bettors cautious. Even if big players hated the synthetic, they won’t invest a lot on Santa Anita until they see how the surface is behaving. With all these other issues challenging California racing, raising the takeout this year seemed like an unnecessarily risky move. Raising takeout is actually risky anywhere considering horse racing’s place in the overall world of gambling and entertainment. An important presentation made by New York Racing Association Chairman Steve Duncker during The Jockey Club Round Table in August had to do with the competitive pricing of Thoroughbred racing. The blended takeout on Thoroughbred racing is around 20-21%, while it’s 10% on sports wagering, 8% on poker, 6% on slots, and 3% on blackjack. So, Santa Anita’s argument that its racing is more attractive because the trifectas have a 23.69% takeout instead of 26% is like boasting that they’re selling Angus hamburgers for $18 instead of $20 when racing’s competition is serving them up for $5. Instead of jacking up takeout, let’s focus on a way to divert more money into purses from advance deposit wagering; find the right mix that offers widespread distribution at a fair price. It is the only way for racing to remain competitive.